Gado-gado is a traditional dish in Indonesian cuisine, and is comprised of a vegetable salad served with a peanut sauce dressing. Although it is to be eaten as a main meal, many Western countries describe it simply as a salad. It is widely served from hawkers carts, stalls (warung) as well as in restaurants both in Indonesia and worldwide. 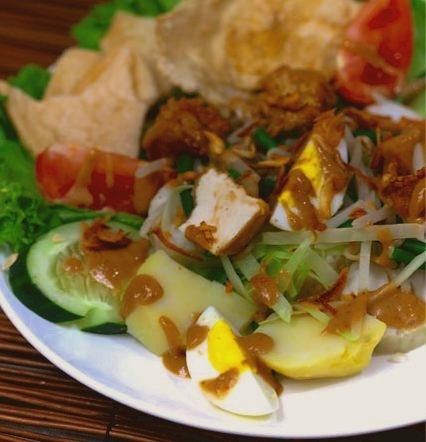 Gado-gado is part of a wide range of Indonesian sauce & salad combinations; with lotek, pecel and karedok. In many places, to retain authenticity in both the production and flavor, the peanut sauce is made in individual batches, in front of the customers (see picture left). 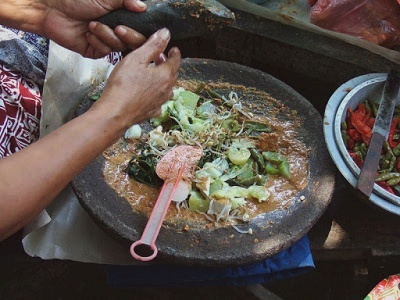 However, since the dish has gained popularity (because of the increase of Asian-themed restaurants) Gado-gado sauce is now mostly made ahead of time and cooked in bulk, although this is probably more common in Western restaurants rather than in Indonesia. Compared to both standard Western salads and Indonesian versions of this dish, Gado-gado has much more sauce in it. Instead of being used as a light dressing, the vegetables should be well coated in the sauce. Many stores now offer Gado-Gado dressing in dried blocks to which you simply add hot water, making it easier and cheaper to cook at home. Place lettuce, slices of lontong and boiled potatoes, blanched vegetables, wedges of boiled egg, slices of fried tempe and tofu, and wedges of tomato, slices of cucumber. Pour the warm sauce over, garnish with fried shallot, crushed shrimp crackers and emping nuts crackers. Put sambal on the side as people has different tastebuds to handle the spiciness. You can omit the sambal if you don’t like the spicy sauce. If the sauce to thick, add a small amount of water. Always try the sauce before remove from the heat, so you can add salt or coconut sugar to match your tastebuds. Serve gado-gado sauce while it is still warm. Warm up the sauce if it is cold. If you still have leftover sauce, keep it in a jar and refrigerate/freeze. You may use for other dipping purposes.